The Winter Issue is Here - Click to Read! Information Governance World magazine covers major facets of IG, uniting them under the umbrella of a common vision. IG programs help organizations secure, control, and optimize information to meet legal and compliance requirements, reduce risks and costs, and leverage information value. Our goal is to educate and inform IG professionals, while providing an integrated sphere of media services for suppliers to the Information Governance marketplace. 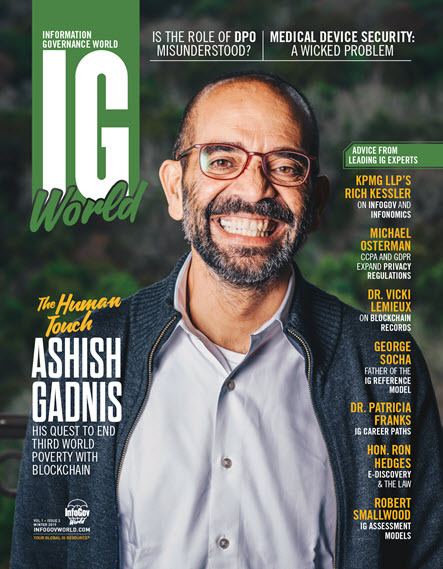 The editors of IG World know what they are doing—with features in the launch issue on cutting-edge issues like the role of analytics in IG programs, as well as on topics like blockchain solutions and GDPR compliance. I wish everyone at IG World much success! Information Governance World is a beautifully executed magazine that is chock-full of valuable, even essential, IG information. IG World, is as impressive as it is comprehensive & detailed. 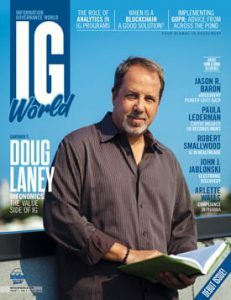 IG World Magazine provides relevant information for IG professionals and I especially enjoyed the interviews and event listing! I really enjoyed reading the articles related to so many IG topics. This issue was varied and provided some new concepts to me, like Infonomics, which I'm interested in exploring further. Looking forward to the next issue! InfoGov World has shined the spotlight on important topics that affect corporate governance. Coming soon – more resources and opportunities to share! We welcome your participation and encourage you to submit suggestions for topics to be covered in future issues.